A few minutes into the start of SUPER DARK TIMES, just after a scene of sinister silhouettes of towering trees, a stag crashes through the front glass doors of a school in suburban, upstate New York, trailing blood from its inexplicable entrance point through the hallways of the school to a classroom where it collapses. A police officer subsequently puts the animal out of its misery. Stomping the head of the dying animal. Twice. That vicious opening sequence for this viscerally stunning, tour de force should make audiences shudder. SUPER DARK TIMES is an allegory about the spinelessness and lack of character of today’s millennials, though, according to publicity blurbs and other reviews, the times in this movie are reportedly rooted somewhat in the Columbine High School massacre in Littleton, Colorado, in April of 1999. So, yeah, I’m rebutting the theories and opinions of the Columbine High School Massacre, though, in itself, Columbine was a harbinger of things to come, hideous things, that is. Zach (Owen Campbell) and Josh (Charlie Tahan) are [suppose to be] best of friends growing up in a bucolic and idyllic Upstate New York suburb in the 1990s. They are both infatuated with the incredibly fetching Allison (Elizabeth Cappuccino). Those three, their friends, rivals and adversaries in this picturesque and idyllic setting are looking for kicks, hoping for popularity and navigating the trials and tribulations of nascent sexual desires – and just beginning to experiment with, uh oh, reefer. Not crack, not cocaine, not prescription drugs ripped off from mom’s and dad’s bathroom pharmaceutical cabinets, nor opioids in this community. SUPER DARK TIMES is much more than a film about high school teens coming to terms with adolescence or post-adolescence angst but about the millennials of white, suburban America who are ill equipped morally to confront the dilemmas and vagaries of life. Some publicity blurbs may have made it appear that this is a teens-go-crazy horror fest, sans a supernatural element, when it is actually a mind-blowing tale by a talented director and his talented production crew and flawless acting by talented actors. Left to right: Owen Campbell as Zach, Elizabeth Cappuccino as Allison, and Charlie Tahan as Josh. 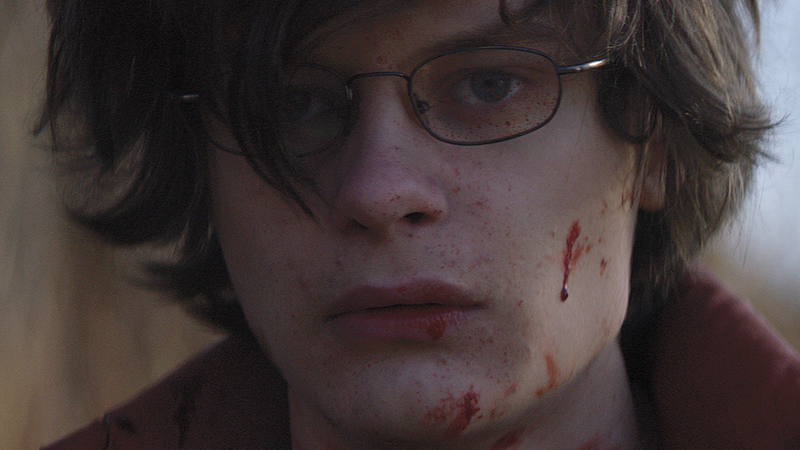 Charlie Tahan as Josh in SUPER DARK TIMES. Photo by Eli Born. A fatal accident occurs when a friend in a group horsing around with a dangerous weapon – not an AR-15, nor an assault shotgun nor a 9mm Glock nor any of those pee-shooters AKA Saturday Night Specials – is impaled with a samurai sword. What to do, what to do? Do his friends rise to the occasion? Hell no, they pathetically wimp out. In a Disney-esque film the teens might eventually do the right thing, drawing on the the mores and values they picked up from their churches, school, families and community. True, I haven’t seen any movie recently with teens rising to the occasion, standing their ground on principles that are suppose to be the bedrock of this ailing democracy. SUPER DARK TIMES is a Kevin Phillips monster of a movie and the denouement is his denouement: Narcissism, fear, guilt, paranoia, and smoldering rage swamp the tepid mores of the impaled youth’s friends, whose friendships spiral into an abyss of despair. Owen Campbell as Zach, Charlie Tahan as Josh, Max Talisman as Daryl, and Sawyer Barth as Charlie. Photo by Eli Born. Although the setting is reportedly in the 1990s, this writer believes Phillips was influenced by, or drew on, the national headlines of the most tumultuous and savage events of the last 10 years for his 1990s. SUPER DARK TIMES is a cinematic wonder. Scenes – from the hallucinogenic-like, visual moments revealing the guilt, paranoia and smoldering rage of key characters to the bucolic and idyllic settings of Upstate New York – are exquisitely picture perfect. The soundtrack has a moderately minimalistic feel. Sound affects add a percussive musicality that supplements the soundtrack. Together, especially in the last 30 minutes, the fusion creates a tsunami of excitement and drama. Mounting tension can keep audiences in theaters and at home glued to their seats. – Acting, superb, from principal characters to the rest of the cast. Max Talisman’s performance as Daryl was powerful. Picture, closing minutes, screen shot from trailer, courtesy The Orchard. SUPER DARK TIMES is intense. The album features 13 original songs composed by experimental composer Ben Frost (SLEEPING BEAUTY, THE DEEP), whose previous albums include the critically-acclaimed By The Throat (2009) and A U R O R A (2014). Can be found at Amazon and these other sites: iTunes, and Soundtrack.net.